Abstract: Imagine a trade show centered on computer hardware, like Comdex in Las Vegas and add a thirteen-hour trip over the expansive Pacific Ocean. Imagine a trade show centered on computer hardware, like Comdex in Las Vegas. Subtract a touch of the panache that has made E3 the spectacle it is and add a thirteen-hour trip over the expansive Pacific Ocean. Affectionately referred to as Computex, this show is host to all of the major motherboard manufacturers in the world, the most influential chipset designers and both contending processor companies. A multitude of peripheral, networking, handheld and case vendors round out the package, making Computex an attraction well worth the 6500-mile journey. Although Computex 2001 did not boast the expansive layout of last November's Comdex, the action was far more concentrated and featured several announcements from the industry's most influential firms. 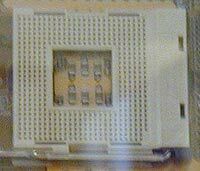 One of the strongest presence's at the show was exuded from Intel and their i845 chipset, formerly referred to by its codename, Brookdale. With an apparently enormous budget for marketing, Intel Pentium 4 balloons littered the show floor as well as the booths of motherboard manufacturers featuring Intel-based products. The majority of the board designers on hand were flaunting Brookdale solutions, a sign that Intel's latest chipset catering to the mainstream Pentium 4 audience has gained a more enthusiastic acceptance than the costly i850. Fundamentally, the two chipsets deliver the same feature set, only the i845 supports PC133 single data rate memory (SDRAM) rather than the controversial RDRAM interface. The most obvious drawback to PC133 is the limited potential for memory bandwidth, a factor that has played an especially important role for the Pentium 4. With a maximum theoretical throughput of 1.06GB/s, i845's performance will be lower than that of the i850 and its 3.2GB/s. However, Intel's Pentium 4 does not stand to gain as much from single data rate (SDR) memory as it would from double data rate (DDR) memory. According to one motherboard manufacturer, support for DDR has already been added to Brookdale, with a software code update and modified pin orientation being the only requirements necessary to adapt the chipset for operation with the faster memory standard. Indeed, with a theoretical maximum throughput of 2.1GB/s, PC2100 DDR memory, i845 would be able to make the Pentium 4 more competitive to the Athlon in terms of price without sacrificing valuable performance. Unfortunately, licensing agreements with Rambus keep Intel from pushing ahead with a DDR board until 2002; however, the prospect of a 2001 introduction is still viable. Interestingly enough, all of the i845 boards on the show floor were compatible only with the Socket 478 interface. For the time being it appears as though the current Socket 423 will be forsaken - a fair warning to prospective Pentium 4 owners. 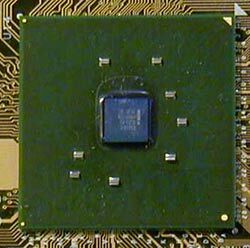 When the 130-nanometer Northwood processor is introduced on the new socket standard, the current incarnation of the Pentium 4, Willamette, will also make the transition. Despite the smaller interface size (not to mention die size in the case of Northwood), Socket 478 motherboards will come outfitted with a new layout for thermal management. It has already been observed that the Pentium 4 is capable of generating significant heat output. After the move to a 130-nanometer manufacturing process, the processor will dissipate less power, but will suffer from increased heat density caused by packing all 42 million transistors closer together. Accordingly, we have heard that upcoming Pentium 4 heatsinks will be designed with a thicker copper base for faster heat transfer. This will undoubtedly aide in keeping the processor running stable as the frequency of the Pentium 4 is ramped beyond 2GHz.